I made it out to the Knitting & Crochet Guild exhibition in Sunderland Art Gallery yesterday, so today I feel like a small piece of chewed rag. I also have toothache... Still haven't found a wheelchair-accessible dentist in the area! 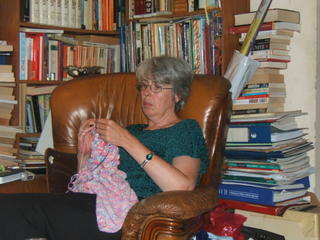 Hi Heather, glad you made it, but sorry the price was so high - chewed rag and toothache! Hope it went well, I was thinking about everyone and wishing I could be there. I hope your toothache is better or fixed. 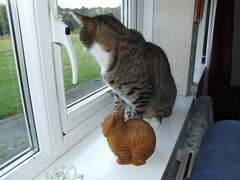 I love the photo of Tigger with his garden ornament friend!